Family Status: Engaged, mother of two boys. 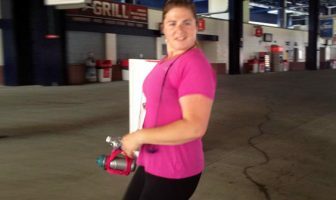 Pounds or Inches Lost: To date I have lost 35 pounds! I became unhappy with my weight when I realized that I didn’t feel healthy, I was 2 pounds away from my highest pregnancy weight and I had a 10 pound baby! I could not fit into my cute clothes anymore. I was in a size 16 top and 14 pants and could wear clothes in the plus size stores (I used to wear petites). I was having chest pains and I was frequently tired. I also became winded after walking upstairs. I am still working on it. Currently, I am 16 pounds away from my target weight goal! Pray for strength and knowledge. 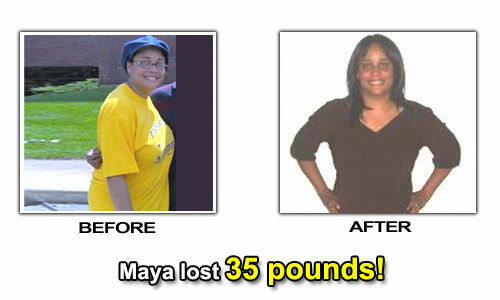 Maya’s Weight Loss Eating Plan! High fiber organic cereal, yogurt or egg whites, fruit. Spinach salad with a BUNCH of veggies and one serving of protein, fruit, whole grain crackers. One lean protein, 3 servings of veggies, one healthy starch (sweet potato, brown rice, couscous, etc). Fiber bar or 100 calorie popcorn or a piece of fruit or mini-carrots. Jillian Michael’s 30-Day Shred incorporates weight training in the videos, P90X Ab Ripper X. 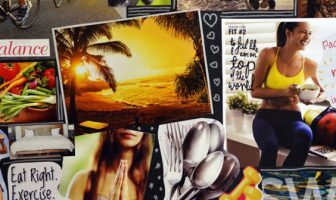 Running and Jillian Michael’s 30-Day Shred.